The Iso•Max VRD-1FF is a high performance capacitive based isolator that has been meticulously designed to break the ground loop that causes hum and buzz in audio and 60 cycle hum bars in video. Housed in a compact cylinder and designed for use with RG59 or RG6 type cable, this second generation VRD-1FF employs a unique RF engineered solution that delivers a ruler-flat response from 2 Mhz to over 1300 MHz spanning the VHF/FM/UHF and CATV spectrum. The VRD-1FF’s exceptionally linear response prevents frequency dips that can cause channels to drop out in digital cable. Gold plated F connectors are carefully machined to ensure true 75 Ω compatibility for optimal signal integrity while minimizing reflections and ghosting. Plug and play easy to use, this passive solution doesn’t require any power. One simply inserts the VRD-1FF in series with the incoming signal and it quietly goes to work without degrading the signal. 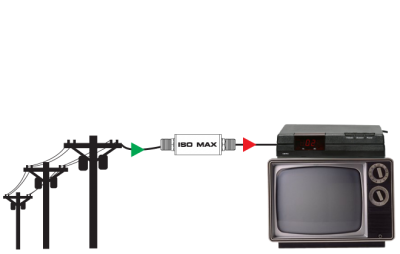 This makes the VRD-1FF a ‘must have’ for the AV technician that is servicing and installing digital cable as well as conventional CATV or VHF/UHF antenna or MATV systems. Important Note: The VRD-1FF is NOT suitable for use with RG11 cable or as an isolator for satellite dish systems. 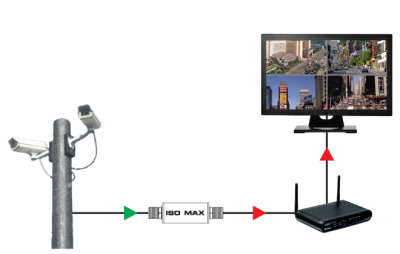 The Iso•Max VRD-1FF is the perfect ‘trouble-solving partner for digital video transmission problems. It isolates the source and destination without introducing frequency dips that cause channels to drop. It works equally well to get rid of audio hum and buzz with standard cable TV. When interfacing a distant camera to a video system, hum in the form of 60 cycle hum bars will often find their way into the picture. 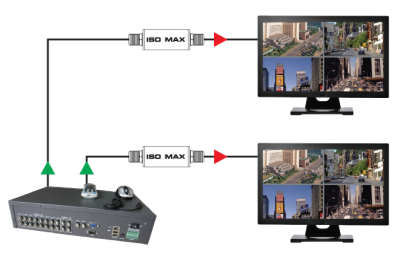 The Iso•Max VRD-1FF provides a plug & play solution that eliminates the problem-causing stray DC currents without affecting the video quality. Distributing video around a large facility such as an airport, arena, or convention hall can often lead to quality picture problems caused by fluctuating voltage references at various power drops. 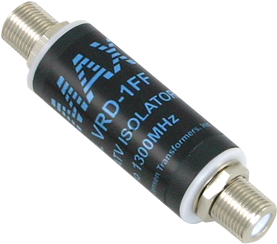 The VRD-1FF isolates the local monitor from disruptive DC currents.